The Communist Party USA was, technically, my first political home as a young teenager. Although admittedly only a paper member of their youth organization, the Young Communist League, the party’s newspaper and literature were the pillars which my budding radicalism was built on. Being isolated in a solidly Democrat, but socially conservative and, in many ways, racist section of Eastern Iowa, the stories and perspective of the Young Communist League and CPUSA's publications excited me and made me feel less alone. Like many paper members of radical organizations, I began to drift away from interest in the group. The CPUSA/YCL not being a real, tangible thing in my life made it easy to do so. During my membership, I never met another member nor was contacted personally by one. Eventually, I rejected them and their Leninist politics, but I've maintained an interest in their more active periods, which is why I recently read Theodore Draper’s book about the American Communist movement in the early years of 1917-1921. The Roots of American Communism mostly covers the formative years of the CPUSA, from 1917-1921, although it does give background in the form of where the party came from, such as the Socialist Party of America, the Socialist Labor Party and the IWW. The author, apparently, was a former ‘fellow traveler’ of the party, having been involved in one of its front groups, but never having joined the actual party. He seemed to have broken with them in the early 1940s. With any book about the CPUSA or their brand of ‘Communism’, you have to preemptively check the background of the author. Many accounts are either fluff pieces that fawn over the party like a true believer, or they are reactionary hit pieces written by right-wing anti-communists who are opposed to any form of working class self-activity. But this book seems fairly balanced. It criticizes the party line, and points out holes in its official history, but you can also see the author’s sympathy with certain individuals or stances. If I was to describe his overall perspective, it's from someone who identified somewhat closely with the aims and objectives of the party, but then broke with them in a way that wasn't bitter. So it has its shortcomings, but it’s basically fair. Some of how he frames things in the book is a bit annoying though. For instance, there is an overarching sentiment of historical progress and inevitability when describing the development of American radicalism in the early 20th Century. Particularly with the IWW, which is often portrayed as sort of a naive, stubborn throwback when faced with the emergence of the Communists. This is ironic considering that the revolutionary syndicalism of the IWW was barely 15 years old at the time, while the seizure of power by a minority of would-be revolutionaries on behalf of the masses is the very definition of a naive, stubborn throwback idea. One of the most surprising things I learned from this book was the fluid nature of radical politics in America during this period. In retrospect, it shouldn't be surprising, as this preceded the hard lines of ideology that followed. Back then, though, the lines between syndicalist, Leninist, left communist, anarchist and socialist were quite blurred or didn't yet exist. For instance, the earliest formations of the CPUSA refused participation in electoral politics or in business unions, stances that are now more identified with the IWW, left communism or anarchism, rather than organizations that maintained a nearly 70 year relationship with the USSR. Also, apparently, future council communist theorist Anton Pannekoek had more influence on the socialist and early American Communist movements than even Lenin until a couple years after the Russian Revolution. In the history of American anti-capitalism, few organizations have seen more members, more influence and more involvement in struggle than the Communist Party USA1. From its roots in the “Left-Wing” of the Socialist Party of America and its foreign language federations up to when it was nearly destroyed by McCarthyism in the 1950s, the CPUSA was a part of nearly every social struggle that existed, in some fashion. Personalities such as James Cannon, Angela Davis, Elizabeth Gurley Flynn and William Z. Foster all passed through the party at one time or another. And through its front groups and cultural associations, numerous writers, actors and musicians became ‘fellow travellers’ of the party. They were one of the driving factors behind the CIO’s explosion and secured leadership positions in multiple industrial unions before being red-baited and largely expelled in the late 1940s. This is, of course, the more positive history of the party. They also slavishly operated as a branch of the Soviet Union’s interests, changing policy and direction as the USSR did. They were probably complicit in the kidnapping and murder of Juliet Stuart Poyntz. During World War II, they supported the no-strike pledges, the internment of Japanese-Americans, and the use of the Smith Act against Trotskyists2. And of course, their whole ideology is as responsible for the crushing of 20th Century working class self-activity as any U.S. administration or coalition of capitalists. This particular brand of Marxist-Leninism killed the Hungarian Revolution, sent in tanks against the Prague Spring, slaughtered dissident sailors and workers in Kronstadt, beat the Makhnovists in Ukraine, and jailed or killed anarchists and dissident socialists during the Spanish Civil War. In addition, their ideology’s adherents actively fought against the best elements of May ’68 in France and the post-WW2 wave of factory occupations in Italy3. In between the ‘good version’ to be proud of and the ‘bad version’, which is politically and morally objectionable, there is some complexity to the party. Despite its hierarchical nature and its obedience of the Soviet line, how this transferred down to rank-and-file members and what they did seemed to differ depending on the time and place. We have to remember that unlike other regions, where syndicalism, anarchism or other ‘ultra-left’ variants were strong, in the U.S. they weren’t. So organizers and individuals who might have been pulled to one of those tendencies somewhere else, were instead largely pulled into the realm of the CPUSA. Today, the CPUSA exists as a shell of its former self, consistently hemorrhaging its influence and membership long before the collapse of its major funding source, the Soviet Union. They’ve been reduced to a sort of indefinite hypothetical popular frontism, supporting the Democratic Party even less critically than they did during different times in the 1930s/1940s, except without any sort of mass base or organizational relationship with the Democrats. Probably more than any group, it lives off the reputation of its past, while its actual involvement in existing social movements is tenuous and irrelevant. With some slight alterations, this could just as easily describe the Tea Party, American "libertarianism" or even elements of the Occupy movement. I'm not sure what to think about American Exceptionalism, as viewed by early Communists, but it feels strange and unique how dissent is often expressed here. Where applying this view as conventional wisdom to apply to the United States breaks down is looking at race. The views described above, which reveal a small businessperson (almost artisan) view, has been almost entirely taken up by whites. The racial disparity when it comes to this kind of "anti-establishment" view, also reveals the racial caste system. Not just proportionately, but ideologically, whites are more likely to be and explicitly identify as and with the interests of the middle-class (however defined). Radical movements are a kind of university for many people. This is likely even more true post-New Left than it was in 1957, the year this book was written. Unlike the period the author is speaking about, today radicalism has been largely (but not entirely) marginalized to the actual universities. For those of us with less formal education, the radical left provides us with teachers, study groups, experimentation with tactics, discussion, analysis of outcomes, etc, in a way very similar to what one might generally find in the university. The author correctly points out there is the matter of status at stake, as well. No one wants to feel one-upped by someone who is smarter than them. Often, the goal then is to match that status with an equivalent or greater amount of knowledge than the other person. Of course, this isn't always helpful and there are some that dislike both the existence of an intellectual culture on the radical left, as well as its excesses. Finding the latter problematic is understandable, objections towards the former I have less sympathy with. Particularly in the IWW (but also visible within most strands of anarchism), there is a historical tradition, still clung to by a small minority of people, of calling discussion and debate "theory", which is then placed into an either/or comparison with "action". Some people like to call this way of framing things as "Don't think! 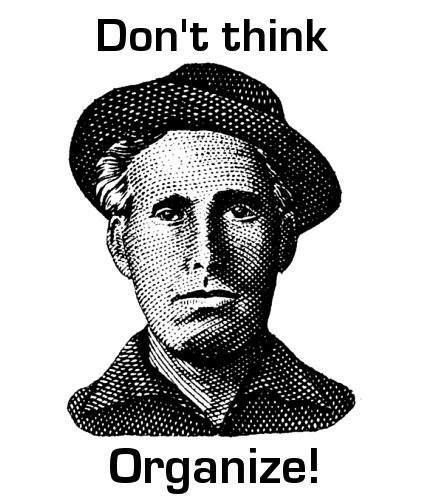 Organize!". The two are obviously not opposed. Every large working class movement has included a rich intellectual culture. There has never been a movement without this. As for the quote from the book, I'm not sure this is particularly unique to Marxist movements, though. Religion, atheism, and environmentalism are some examples that have this dynamic as well. What they all have in common with radical movements, notwithstanding forms of volunteerism and activism, is a wholly or semi-encompassing view of how things should be done. 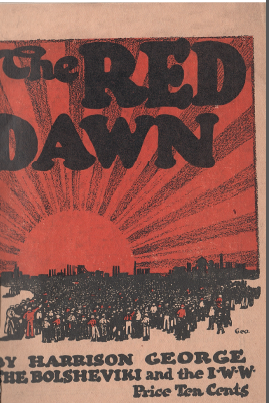 Along with Harrison George's pamphlet, another pro-Bolshevik pamphlet published by the IWW at the time was Industrial Communism by Harold Lord Varney. It's interesting that the IWW was the earliest promoter of the Bolsheviks. Like much of the socialist and anarchist movements, there was initial optimism, if not enthusiastic approval of the Bolsheviks. In this, the IWW was not unique. But, very shortly, even before anarchists like Emma Goldman and the Spanish CNT, the IWW became suspicious of what was actually happening in Russia, and rejected affiliation to both the Third International and the Profintern. The fact that the Russians and the CPUSA insisted that the IWW dissolve into the AFL didn't help. Eventually, after a war of words between IWW and Communist publications, a few thousand Wobblies left for the CPUSA. By the 1940s, a mere letter from the director of a library in the Soviet Union triggered a scathing response and indictment of the USSR by the editor of the Industrial Worker. Besides brief mention in these two books,information on these ‘councils’ is relatively sparse. 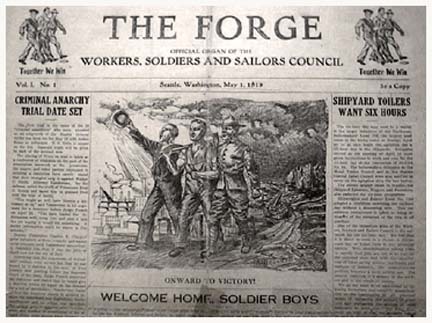 Colin Anderson, in his article ‘The Industrial Workers of the World in the Seattle General Strike‘ mentions Wobblies speaking to the ‘Soldiers’, Sailors’, and Workmens’ Council’ in Tacoma circa 1918. According to John Curl, the councils in Portland, Butte and Seattle were organized by the Communist Labor Party and the Communist Party of America, the predecessors to the CPUSA. The councils were then eventually destroyed by the upcoming Red Scare and Palmer Raids. For what it's worth, the anti-communist and anti-IWW mayor of Seattle claimed the IWW was behind the councils. Other regions that had something with the ‘council’ name includes Toledo and Buffalo. The Soldiers’, Sailors’, Workers’ and Farmers’ Council of Buffalo has a bit more primary information available than the Toledo one. In March of 1919, there was a mass meeting called by it. It was met by police clubs and guns. Fred Thompson talks about the Toledo Soldier's and Sailors Council, saying that one was formed as an IWW strike spread to other factories9. Apparently, the strike funds raised by this council were instead used to pay for propaganda materials. Since the early formations of what became the CPUSA tended to see strikes in that period as opportunities for general insurrection, this sort of use of the strike funds would make sense in their perspective. So its very possible this council was CPUSA initiated. Along with the previously mentioned Seattle, Butte, Portland and Toledo, Ward Churchill in The Cointelpro Papers quotes from a book (it's unclear which one), which adds Denver to the list of post-WW1 councils in the U.S. Finally, in the April 26, 1919 issue of The Revolutionary Age, a paper run by the "Left-wing" of the Socialist Party, there's an article, reprinted from the Western Socialist, another "Left-wing" publication, titled 'American Soviets May Hold Convention'. Based on this limited information, there seems like there were 3 types of things called 'councils' during this period. 3) Some other body initiated by CPUSA radical left competition. One major criticism of the Old Left by the civil rights movement and New Left of the 1960s was their total in-adequateness when it came to the issue of race in the United States. While I do think some leeway should be given to people from a different time and place, and some credit should be given, there is a limit. Even in this time period's best example of interracial cooperation in radical movements, Local 8 of the IWW on the Philadelphia docks, there were limitations because the unity was at least partially achieved through an affirmation of masculinity11. In the case of the early Communist movement, in the face of a resurgent KKK, an anti-lynching movement and a massive migration of black southerners up North, it seems inexcusable and mind-boggling that these issues were not on their radar. 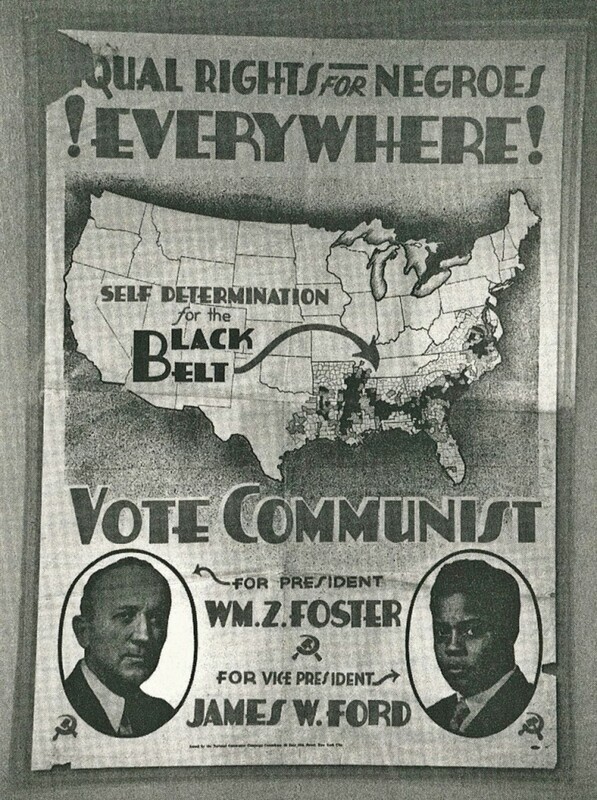 Eventually this changed, as the CPUSA advocated 'self-determination' in the 'black belt' of the Southern U.S., did antiracist organizing in Alabama12 and were instrumental in the appeal for the Scottsboro boys. Draper's book is incredibly detailed and a good resource for those interested in this period. Some of the questions faced by the CPUSA, Socialist Party and IWW then are ones we still deal with today, so it's worth going back to when those questions started. The author wrote a follow-up, American Communism & Soviet Russia that takes the history of the CPUSA up to 1929. I plan to read that as well. 1. 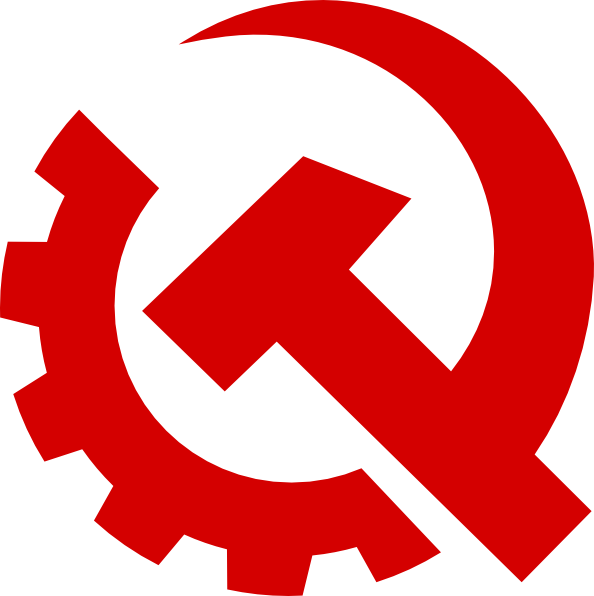 The Communist Party USA has been the name of the party which was officially recognized as THE Communist party in the United States by the Comintern and USSR since 1929. But it has been known by other names, such as Communist Party of America, Communist Labor Party, United Communist Party, Communist Political Association, and the Workers Party of America . Additionally, there were a number of short-lived splitoffs and ideologically very similar factions and parties that could be considered still part of the broad Party, such as The Workers Council, United Toilers of America, and the Communist Party USA (Opposition). look forward to reading this, juan. i've read drapers book many,many.many years ago. and it is often one of the standard pioneering non-CP works. This particular brand of Marxist-Leninism killed the Hungarian Revolution, sent in tanks against the Prague Spring, slaughtered dissident sailors and workers in Kronstadt, beat the Makhnovists in Ukraine, and jailed or killed anarchists and dissident socialists during the Spanish Civil War. I get why it's important to be clear about not being nostalgic for the good old days of the CPUSA, as many American leftists are, so you have to list the bad with the good. However, it's also important to recognize that Stalinism was a process of evolution. There's certainly a continuity between Kronstadt, Spain, and the Prague Spring, but it is a very punctured continuity. I think you recognize this but anarchist theory is often very ahistorical so it's important to avoid it when possible. A second thing, you telescope the IWW's history and leave out any mention of organizing in the thirties, jumping straight from the early 20s to "Chicago Replies to Moscow" in 1945. Yet there were major organizing drives in the mid and late thirties, and an articulated critique of the CIO and the up-and-coming labor bureaucracy - a critique rooted in practice. Third thing, kind of petty, but I coined the phrase "Don't Think! Organize!" around 2007, didn't realize it had gone anywhere. Oliver, the book technically only covers 1914-1923, with the vast majority concentrating on 1917-1921, so really anything mentioned outside those years is an aside on my part. Apparently, that particular one wasn't a good aside, since you, a reader, got stuck on it, which is bad writing/editing on my part. In any case, I don't think it's true that I collapse the CPUSA's entire ideological history into one paragraph, although I think its difficult to talk about an ideological history of the Party post-1921, and for sure post-1930s, that is separate in any meaningful way from Soviet direction and policy. Also, it's early in the morning, so maybe I'm missing something, but I don't actually mention Stalinism at all in this review, because the CPUSA was only Stalinist when Stalin was actually alive. Their obidience to the Soviet line had them change to whatever the USSR was, which wasn't always Stalinist. I instead use Leninism as a descriptor, and without getting into a debate on the essence of Leninism, I do believe there is a continuity between events like Kronstadt and the Prague Spring within that ideology. On the IWW, I only really talk about them in relation to the CPUSA and Russian Revolution, it'snot meant to be a history of the union. If there are materials available that talk about the IWW in the 1930s in relation to the CPUSA and USSR, please let me know what these are, because I haven't seen them. I've also heard (but not seen) that the IWW had critiques of the CIO, but that's even more of a side point than my side points, since I only mention the CIO in passing, as part of quick overview of the Party. Nevertheless I agree that there was an important diversity in the early CP and I always wonder if that was why the US became one of the main centers of Trotskyism in the 1930s, because of that initial diversity. Added a little bit more information I forgot I found on 'American workers councils'. I guess what I was trying to say is that this is a history of the party pretty much up to it's Russification, if you like, and the expulsion of the left opposition. There's certainly a continuity between all of those things, especially Spain-Hungary-Prague, but the continuity with Kronstadt and Ukraine is punctured. After all, those last two were and continue to be ideologically justified and upheld by the Left Opposition and its descendents, but that left opposition was what became the POUM in Spain, or what became the Trotskyists in the US who led struggles against the CIO's no-strike clauses. To put it differently the roots of the post-1928 CPUSA are definitely in its foundation, but so are the roots of the Left Opposition and even the Johnson-Forrest Tendency. This came up on Facebook, so I thought I'd say something about the author's political background post-'fellow traveller' period. Apparently he became a liberal anti'communist' after World War II. This book was also published by funds from the Ford Foundation. In the New York TImes obituary of him,it's mentioned that the New Left criticized the book for taking "an institutional approach obsessed with the heavy hand of the Soviet Comintern." I guess I can agree that it is more of an institutional history. That's a problem of many history books that revolve around a political movement or organization. Does it invalidate the book, though? I'm not sure it does. If it had been written about the 1930s-1940s, when the CPUSA was more involved in mass movements, this would be a massive shortcoming to write an institutional history, but as this is mostly focusing on 1917-1921, the formative years, when the CPUSA had not many links to any movements at the time, and was mostly focused on propaganda and internal squabbling, it makes sense. His follow-up book, goes to the late 1920s, I'd be curious if it retains that same institutional history. Thought it was interesting that the Trots from the Socialist Equality Party do state that he was a bitter anticommunist, but that he approached the book dispassionately and that it is accurate. Also, they pick up on the sympathies for individuals that I mention in my review, and ascribe this to some sort of unrecognized preference for Trotskyism (which may or may not be true). James Cannon also seemed to agree with the accuracy and details of the book, although he didn't agree with the author's perspectives. The letters he wrote to Draper for the book were published as The First Ten Years of American Communism, btw. The North Star is a forum for socialist renewal. Emphasizing discussion and debate, this project is partly inspired by the North Star Network, a Marxist group founded by Peter Camejo in the 1980s that integrated former members of the Socialist Workers Party, a Trotskyist group, and the Line of March, a Maoist one. Camejo believed that the future of radical politics in this country lay not with the existing three-letter left groups but elsewhere. Taking its name from Frederick Douglass’s first newspaper, the network sought to throw off the baggage of dogmatism and sectarianism plaguing Marxism, emphasizing the importance of open debate. Our editors and contributors, however, pull from a long and varied tradition of socialist thinkers — from social democrats to anarchists to ultra-leftists, Amadeo Bordiga to Clara Zetkin, Paul Mattick to Louis Althusser, Buenaventura Durruti to Gilles Dauve to Eugene Debs. Reflecting this heterogeneity, we aim to put North American socialists in conversation with socialists in different traditions and cultures as a means of revitalizing a field that can seem lacking in new, original thinking. I just started Fraser Ottanelli's The Communist Party of the United States: from the depression to World War II. In the introduction he talks about how the study of the CPUSA has been mainly influenced by the early works in the 1940s and 1950s, such as Draper's. These histories have mostly been concerned with the Party from the perspective of the "Soviet origins of [its] policies". He advances Harvey Klehr's work, which picks up where Draper left off, as the most extreme example of this. Ottanelli also says the New Left historians like James Weinstein and Stanley Aronowitz also concentrate on the relationship between the USSR and the CPUSA, although for different reasons. They implictly agree with Draper and Klehr, but as radicals, they are more concerned about how this effected the possibility of a developing socialist movement. It was my impressions that the New Left critique was that Draper gave no room for the story of the rank-and-file, but Ottanelli says these stories have appeared in "recent studies". The book is from 1991, so 'recent', I'm assuming means the late 1980s. When I think of the term New Left, I don't think of it encompassing anything in the 80s, so now I'm wondering if the New Left actually did have a critique of Draper's work at all. Ottanelli goes on to say that these more recent "social histories" and rank-and-file stories have added balance to the overall material, but taken by themselves, they skew too far in the opposite direction. At the end of the day, the CPUSA "was a highly centralized Leninist organization that had little room for the diversity [...] that characterized the Socialist Party". So a merging of the two perspectives is needed. What the CPUSA did depended on a number of factors, how the Party saw its situation, Soviet demands, rank-and-file activity, etc. Juan, see "theodore draper" site:www.marxists.org/ for some interesting back story correspondence between Draper and some of the folks/situations he wrote about. Finally started working on a review of Roger Keeran's 'The Communist Party and the Auto Workers Unions',which I finished reading a while ago. Political differences aside, Roger's book is a good one.